Liverpool easily beat Premier League champions Leicester in their first home game of the season. The Reds looked in control when Roberto Firmino converted James Milner's pass and Daniel Sturridge backheeled to Sadio Mane to clip home a second. But Leicester were given hope when Lucas inexplicably passed the ball to Jamie Vardy to shoot into an empty net. However, Adam Lallana sealed the win by firing a shot into the top corner and Firmino got a second from Mane's pass. Jurgen Klopp's Reds are up to seven points from four games, having played their first three matches on the road because of the expansion of Anfield's Main Stand. Meanwhile, Leicester remain on four points as they prepare for their Champions League debut against Club Brugge on Wednesday. Liverpool keeper Simon Mignolet picked up blood injuries to his nose and then eye, but he lasted the 90 minutes with summer signing Loris Karius remaining on the bench. Liverpool, as has often been the case under Klopp, looked brilliant in stages, especially in the first 35 minutes when they could have been out of sight. Their opener was a good passing move, which ended in left-back Milner playing a great ball through to Firmino, who stepped inside Robert Huth to steer the ball into the bottom corner. 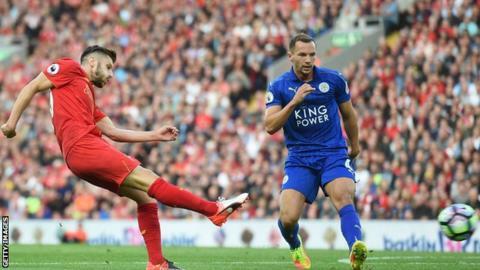 The Foxes defence were again caught out by Jordan Henderson's ball forward for the second and Sturridge squared it with his heel for Mane to score on his home debut. But there will be cause for concern as Brazilian midfielder Lucas started at centre-back, with Mamadou Sakho not in the squad, and he let Leicester back into the game. He miscontrolled a simple pass from Mignolet and - under pressure and in a panic - played the ball across goal to Vardy, who just had to tap into an unguarded net. That gave Leicester hope and they could have had an equaliser when Robert Huth headed a Luis Hernandez long throw-in off the bar. Luckily for the Reds, they got their act together in the second half and Lallana scored his second goal in a week, after his England winner against Slovakia, to wrap up the win, from Georginio Wijnaldum's lay-off. And they added a late fourth when Kasper Schmeichel - who made seven saves in an otherwise good performance - came flying out of his goal with Mane rounding him and unselfishly passing to Firmino to steer the ball past several Leicester defenders. Cause for concern for Leicester? After record deadline day signing Islam Slimani only returned from Algeria duty on Friday night, Leicester boss Claudio Ranieri decided to wait before giving the striker his debut. Leicester lined up with 10 of their 11 regular starters from last season's title-winning team, with Daniel Amartey in for N'Golo Kante, who was sold to Chelsea earlier this summer. And they were outplayed throughout the game, with their only good spell inspired by Lucas' mistake. Ranieri's side only had three shots on target, including the goal, with Vardy also forcing a save from Mignolet from Riyad Mahrez's ball forward. Last season that combination ended so often in a goal - but this year they might need new ideas, so Ranieri will be eager for £29m Slimani to give them fresh impetus up front. Former Foxes captain Matt Elliott, in his role as BBC Radio Leicester summariser, said: "I didn't see anybody have a glaring howler of a game for Leicester, it was more of a general lack of quality. "At times last year maybe the intensity was a little bit more, and the opposition weren't as good as Liverpool, Manchester United, Manchester City are going to be this season." The game was played in front of Anfield's biggest crowd since 1977, with a 54,000 sell-out in the newly expanded stadium. Some 8,500 seats were added to the Main Stand this summer. Roberto Firmino's two goals is enough to make him man of the match. He also attempted more passes in Leicester's half than any of his team-mates - with 43. Liverpool boss Jurgen Klopp told BBC Sport: "It was a tough game against a really strong opponent. "This team is really capable of a lot of exciting things. We played quick but then we conceded and had to show we could fight and stay in the game. "I don't think about where we can reach. We have to be really strong in this league. We have had four away games to begin with, so let's go for it, enjoy it and today I saw some really wonderful things." Leicester boss Claudio Ranieri: "Liverpool played well and deserved to win. We started well, but after the first goal we lost our shape a little. "We tried in the second half, but everything Liverpool tried came good. We created chances, but were a little unlucky. "We have to clear our minds for the next match. When we have lost in the past, we have always had a good reaction." Liverpool have won more games against reigning Premier League champions than any other side has (20). This is the 14th time that a reigning Premier League champion has conceded four or more goals in a single match. Liverpool have scored more Premier League goals in 2016 than any other team (50). Mane has scored eight goals in his past eight Premier League appearances. Vardy has found the net three times in his past two Premier League games against Liverpool. He has scored seven in his past eight league games. Since the start of last season, Firmino has netted more Premier League goals than any other Liverpool player (12). Leicester play their first ever Champions League match on Wednesday, when they go to Club Brugge in their Group G opener (19:45 BST kick-off). They host Burnley in the Premier League next Saturday (15:00). Liverpool do not have any European football this season, with their next match coming at Chelsea on Friday in the league (20:00). Match ends, Liverpool 4, Leicester City 1. Second Half ends, Liverpool 4, Leicester City 1. Attempt blocked. Philippe Coutinho (Liverpool) right footed shot from outside the box is blocked. Assisted by James Milner. Substitution, Liverpool. Alberto Moreno replaces Sadio Mané. Goal! Liverpool 4, Leicester City 1. Roberto Firmino (Liverpool) left footed shot from the centre of the box to the centre of the goal. Assisted by Sadio Mané. Corner, Leicester City. Conceded by Lucas Leiva. Attempt saved. Sadio Mané (Liverpool) right footed shot from the centre of the box is saved in the centre of the goal. Assisted by Roberto Firmino. Attempt missed. Jordan Henderson (Liverpool) right footed shot from the centre of the box is too high. Assisted by Roberto Firmino. Attempt saved. Jamie Vardy (Leicester City) header from the centre of the box is saved in the centre of the goal. Assisted by Ahmed Musa with a cross. Substitution, Liverpool. Kevin Stewart replaces Georginio Wijnaldum. Substitution, Liverpool. Philippe Coutinho replaces Daniel Sturridge. Attempt missed. Daniel Amartey (Leicester City) right footed shot from the centre of the box misses to the left following a corner. Corner, Leicester City. Conceded by Roberto Firmino. Attempt blocked. Daniel Drinkwater (Leicester City) right footed shot from the right side of the box is blocked. Assisted by Riyad Mahrez with a cross. Corner, Leicester City. Conceded by Jordan Henderson. Attempt blocked. Riyad Mahrez (Leicester City) left footed shot from outside the box is blocked. Assisted by Daniel Amartey. Offside, Liverpool. Daniel Sturridge tries a through ball, but Roberto Firmino is caught offside. Attempt missed. Robert Huth (Leicester City) header from the centre of the box misses to the left. Assisted by Luis Hernández with a cross. Offside, Liverpool. Roberto Firmino tries a through ball, but Daniel Sturridge is caught offside. Attempt saved. Jamie Vardy (Leicester City) left footed shot from the centre of the box is saved in the centre of the goal. Assisted by Riyad Mahrez with a through ball. Goal! Liverpool 3, Leicester City 1. Adam Lallana (Liverpool) right footed shot from the right side of the box to the top left corner. Assisted by Georginio Wijnaldum. Attempt saved. Daniel Sturridge (Liverpool) left footed shot from the centre of the box is saved in the centre of the goal. Assisted by Roberto Firmino.